We just got these great new building toys called Wedgits. We got the Imagination set that includes 25 blocks and is for ages 3 and up. These are really fun building toy that really sparks imagination. They are a little different then what you traditionally think of as building blocks, these are triangles that are beveled that you can use to stack, nest, and wedge to make really interesting designs. This is a great way to foster educational play with your kiddos, let them learn about balancing objects, stacking, nesting, and construction. They are really sturdy little blocks so they are not going to fall apart or break. These could really last a long time they are so well-made. My six year old has been playing with ours the most but even my older kiddos get really interested in trying to build and construct the objects shown in the included booklet. So I find that it’s fun for all ages. 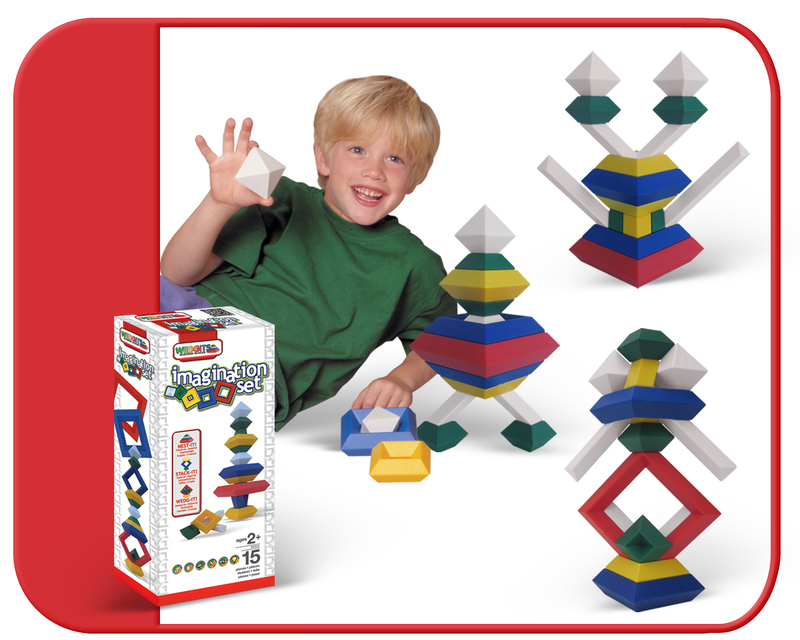 This 25-piece building block product called the Wedgits Imagination series was designed for kids Ages 3 to 10 in. support of gross motor skill development. It is ideal for classrooms day-care facilities or home-schooling environments. Wedgits building blocks are graduated in size. The five primary block shapes nest stack and wedge together. Includes Design Guide booklet and optional ParentTeacher Activity Guides. All Wedgits Imagination sets are 100 compatible. You can purchase them online at Target & Amazon!